Weknow.ac is another homepage hijacker that is promoting a program through a text link Clean Your Mac. This objective is obvious on the startup page of affected internet application. Clicking the said promotional link opens website of MacKeeper. Knowing that Weknow.ac was not made like real and valid search tool, we highly suggest removing it from the computer right away. Many computer users wonder how Weknow.ac was able to enter the computer without their approval. The answer is simply due to various freeware and shareware they have downloaded and installed. Makers of these homepage hijackers are utilizing software bundling campaign to spread browser extension that can manipulate the browser and set Weknow.ac as default homepage, new tab, and search engine. Software bundles, freeware, or wicked third-party applications provided by questionable websites are the usual sources of potentially unwanted program (PUP) and adware. Obtaining and installing programs from these providers similarly loads malicious apps without user’s full knowledge. Same thing with older variants like Search.bittsearch.com and Search.ewatchseries.live, Weknow.ac illegally alter browser settings and control user’s online search setup. As you can see, Weknow.ac can gain access on the computer with zero to minimal effort. The sad thing is, victims will have difficult time getting rid of this adware. Manually clearing adware configuration on the browser does not do to trick some times. Scanning the computer with effective malware remover is highly advise to delete all malicious codes from the computer. Combo Cleaner is a trusted Mac utility application with complete antivirus and optimization features. It is useful in dealing with adware, malware, and PUP's. Moreover, it can get rid of malicious browser hijacker like Weknow.ac. You may need to purchase full version if you require to maximize its premium features. 5. Wait until antivirus downloads it's latest virus definition updates and click on "Start Combo Scan" to start removing Weknow.ac. 2. Once you have located Weknow.ac, click on Remove or Uninstall, to get rid of it. If you cannot find the specified file, please look for any unfamiliar or suspicious entries. It may be the one causing Weknow.ac to be present on your Mac. Arranging all items to see the most latest ones may also help you identify recently installed unfamiliar files. Please press Option + Command + 4 on your keyboard to arrange the application list in chronological order. 4. You may now delete or remove locked files that belongs to Weknow.ac homepage hijacker. 2. Run Malwarebytes Anti-malware for Mac. It will check for updates and download if most recent version is available. This is necessary in finding recent malware threats including Weknow.ac. 5. After the scan, Malwarebytes Anti-malware for Mac will display a list of identified threats, Weknow.ac is surely part of it. Be sure to select all items in the list. Then, click Remove button to clean the computer. - Lastly, remove Weknow.ac from the Homepage field. Replace it with your preferred URL to be set as your default homepage. - Enter the desired web address as your home page, replacing Weknow.ac. Click Save. - Under Home Page field, type the desired URL to replace Weknow.ac settings. Some browser hijacker may also install login item into compromised account under System Preferences. This object automatically runs Weknow.ac during user log in. 4. Next, select user account that runs Weknow.ac. 6. Select Weknow.ac or any suspicious entries from the list and click on the minus [-] button and confirm your actions. Please see image below for reference. 3. Select Weknow.ac or any relevant profile from the left pane. See image below. 5. Close the Profiles window and open the affected browser to change all settings associated with Weknow.ac. The weknow search engine does not allow the dropdown for “edit” or “remove”. So, I can’t change it. @Jayne Rose, what happens if you type chrome://settings/ in the address bar? That should give you access to Chrome settings. Settings>profiles>delete profiles with “Weknow” listed. Thanks for your detailed instructions. I followed them. I downloaded and ran Malwarebytes. However, when going into my Safari preferences/general I’m unable to remove weknow.ac web address and replace it with my regular homepage address. Any other ideas? Has anyone else figured out how to remove “weknow.ac” when it’s defaulted in the homepage field? After following all of these steps, it’s still gray so I can’t change it. @KittyPuff and David H., I’m assuming that Weknow.ac have created a profile on your computer. 3. Select Weknow.ac profile from the left pane. 4. At the bottom of this pane, you will see + – (gear) icon. Click on – to delete the account. 5. On next window, select Delete Home Folder and click on Delete User button. Note: In order to make changes on User Profile, you may need to click the Padlock icon and enter admin username and password. @Chona Esjay I followed that and it still had the weknow page as my homepage. Any other ideas? If the option to change the homepage is grayed out, it is because a profile was installed. You need to delete that first. 4. Highlight the incorrect profile. I don’t know what this one is named, but it should be obvious which one shouldn’t be there. 5. Press the minus button to delete it. 6. Check, and you should now be able to change your default homepage. Everything here has worked except I can’t seem to remove it from opening when I open a new tab (Chrome). How do I get the original new tab page back? I’ve removed everything I can find, still I get the “search” page on start-up. When I go to change default search engine, google is already selected as default! I’m having the same issue as Parker S., please help!!! I reset Chrome and it popped back up in the browser section of chrome. I was not set as the default. There were other browsers that appeared also. I had deleted them previously. 2. Navigate to bottom until you see Advanced. Click on it and scroll down until you see Reset and Cleanup section. 3. Click Restore Settings to Original Defaults and click Reset Settings if prompted. 4. Go back to Reset and Cleanup section. 6. Click Find, to locate and remove harmful software. software asked for my password, I gave it in, and my computer seemed to have a malware, I thank to whoever wrote this tutorial and the malwarefixes website for allowing for such helpful resources to be available for free, I cannot express my gratitude enough, maybe i’ll buy some virtual drinks for you all. cheers. I found out how to remove the search engine. 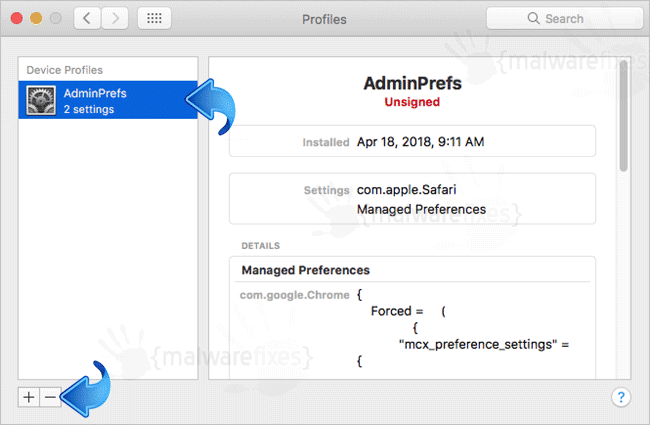 Go to Preferences -> Profiles. Remove all the safari and Weknow.ac related ones. I don’t have profiles in my system preferences. Is there somewhere else to look? Still can’t remove it from my Google chrome start-up page. I’ve tried everything. 3. Click “Find” button to remove harmful software. 5. Click “Reset Settings” button. I had all of the same issues. Chrome would still open to weknow.ac after doing everything else listed. Tried a Safe Boot and after that everything was normal with Chrome again. Somehow after the default search engine on homepage was search, I restarted chrome and it became google. And also, there is still a weird icon next to the Search Engine settings in settings, it says Your Admin Reccommends Specific Value for This Setting or something.